The essence of patriotism, hard work and embracing everyone regardless of ethnic and political affiliation was most striking during the requiem mass for the late former Vice President, Paa Kwesi Amissah Arthur at the International Conference Centre in Accra. Mourners who gathered at the ceremony all agreed that the best send-off for the late former Central Bank governor would be emulating the life he lived. It was all emotions as the casket bearing the remains of the late former Vice President Kwesi Amissah Arthur was laid in state at the auditorium of the Accra International Conference Centre. 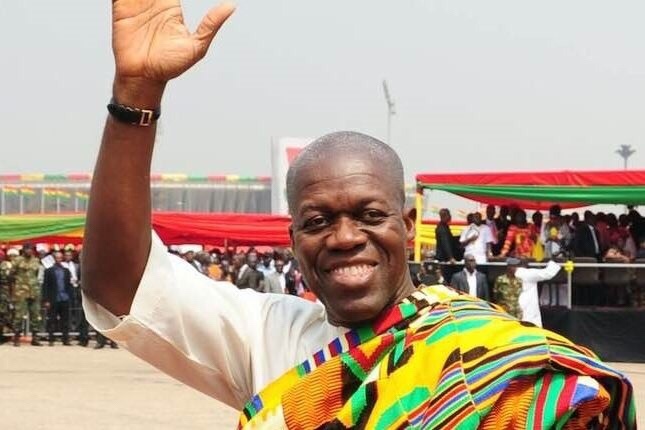 The auditorium together with the foyer was packed with people from all walks of life, different tribes who subscribed to different religions but who on Friday had one thing in common; all of them were Amissah-Arthur’s friends. Here, those considered to be political rivals met and in this unique setting, they eulogized the late former Vice President of Ghana. Present at the funeral were President Nana Addo Dankwa Akufo-Addo, Former President John Dramani Mahama , John Agyekum Kufour , Jerry John Rawlings, former finance minister, Dr. Kwabena Dufuor and other top state officials. Paa Kwesi Bekoe Amissah Arthur 67, was a husband, father and a brother to many and his death, a big blow to his family. In his party’s tribute, the NDC described his as an industrious party faithful whose contribution to the NDC was immense. The widow, Matilda Amissah-Arthur who appeared completely devastated, did not only manage a few words for her husband but also took a subtle swipe at her husband’s critics. The former Vice President and governor of the central bank leaves behind a wife and two children. His mortal remains was buried at the private military cemetery at Burma Camp in Accra.